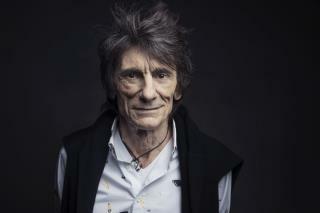 (Newser) – Three months ago, Ronnie Wood was diagnosed with lung cancer, right before he turned 70. In a recent interview with the Daily Mail's Event Magazine, Wood, the other hard-living, hard-partying guitarist in the Rolling Stones, says he refused chemotherapy as a treatment option because he wanted to keep his mane intact. "'I wasn't going to lose my hair," Wood says. "This hair wasn't going anywhere." Doctors discovered the cancerous lesion in Wood's lung in May as part of a routine checkup before the Rolling Stones tour this fall. Wood says he chain-smoked for 50 years but gave up cigarettes last year, before the birth of his twin daughters. I think I see those sunglasses he lost. Wouldn't take much makeup for him to be a zombie on the Walking Dead.